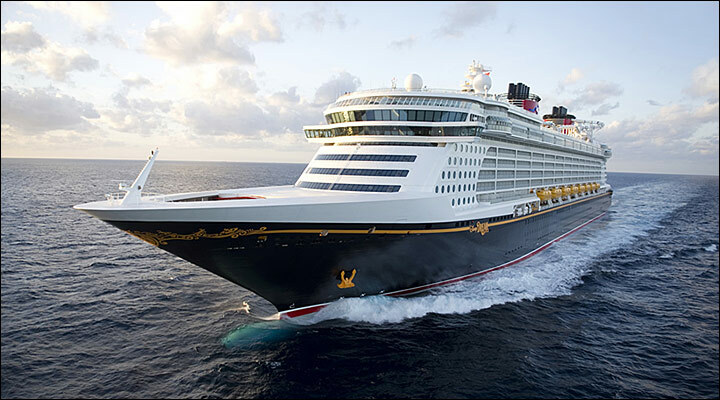 Launched in 2011, the Disney Dream is the majestic third ship in the Disney Cruise Line fleet. Boasting 14 towering decks, a ship length of 1,115 feet and a maximum width of 125 feet, the 128,000-ton vessel includes 1,250 staterooms and has the capacity to comfortably accommodate 4,000 passengers-along with the over 1,458 Crew Members who tend to the needs of every cruise Guest each and every day. Building on the classic style of the previous 2 ships, the Disney Magic and the Disney Wonder, the Disney Dream is a valiant vessel distinguished for its classic early 20th-century design-which harkens back to the golden age of cruising-and state-of-the-art technology. As can be expected from Disney, the cruise liner was specially designed with families in mind, combining sleek style and convenient facilities with splashes of magic and cruise-industry firsts-like the splashtacular AquaDuck, the very first water coaster at sea. 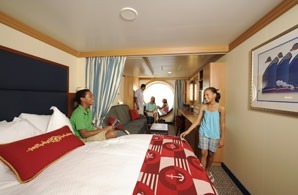 "Standard" comes with substantially more in a Disney Cruise Line Standard Inside Stateroom! Enjoy more space than you'd find on most other cruise ships in a richly appointed accommodation tailored for families of 3 or 4, featuring an elegant maritime motif in contemporary Art Deco style. 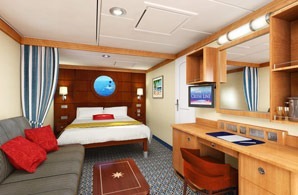 Relax in private quarters fitted with warm wood finishes, custom fabrics and carpeting, original artwork, crown moldings, genuine teak accents and a Magical Porthole for real-time views of the sea—plus virtual sightings of animated Disney characters. 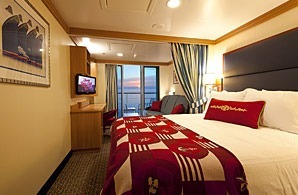 A Disney Cruise Line Deluxe Oceanview Stateroom with Verandah is a well-appointed and spacious accommodation tailored for families of 3 or 4, featuring a stylish maritime motif in contemporary Art Deco style and more square footage than you would find in a standard stateroom. Unwind in private quarters fitted with warm wood finishes, custom fabrics and carpeting, original artwork, crown moldings, genuine teak accents and a private verandah for magnificent views of the sea.